In order to receive First in First Out (FIFO) pickup requests, you will need to follow the guidelines below. Find specific rules for your local airport, and whether or not FIFO queueing is used there, in this list. Wait in the designated staging area. Drivers within the designated staging area are automatically added to the queue. Note: while in the queue, you may still occasionally receive ride requests from outside the airport. Once you’re in the designated staging area, you’ll see how many drivers are ahead of you towards the top of the app. If the staging area is full, you will not be added to the FIFO queue and you’ll need to leave the staging area immediately. Note: If you’re outside the staging area, you won't be added to the queue. To keep it fair for all drivers, you'll lose your spot if you log out, leave the staging area, or deny a request. 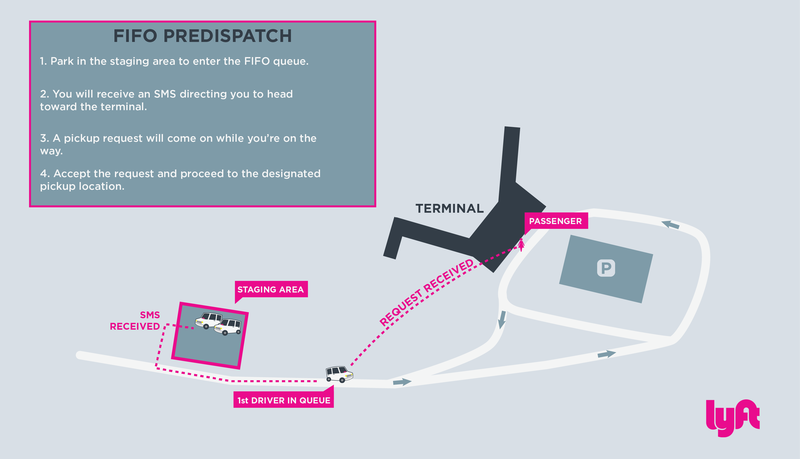 At select airports, FIFO pre-dispatch speeds up the process of getting an airport ride and lowers ETAs for passengers. While waiting for requests at the select airport staging areas (more info below), you will receive an SMS and in-app note directing you to head toward the terminal. While you're on your way, you will receive a ride request. You will not lose your position in the queue. If you do not receive a ride request, head back to the staging area. As long as you're back within 15 minutes, you'll be placed at the front of the queue.